PLANTING: Transplants can be set out year round. Seed can be grown by putting on top of the ground when it’s hot. Not easy to germinate and grow. BLOOM/FRUIT: Spikes of fragrant lavender-blue flowers in summer. GROWTH HABITS/CULTURE: Grey-green narrow foliage, aromatic lavender-blue flower on narrow stalks in spring and intermittently throughout the summer. Shrubby overall growth. English lavender is the easiest to grow. Excellent drainage is a must. PROBLEMS: Overwatering, damp weather causes lots of trouble for lavender. HARVEST/STORAGE: Harvest leaves anytime. Harvest flowers early as they first come into bloom for the best quality. Dry and store in glass if needed. CULINARY USES: Use anyway rosemary is used in cooking. Teas should be made from the flowers and leaves. Flowers are used in spice mixes. MEDICINAL USES: Lavender is antiseptic, sedative, and antispasmatic. Use from capsules or tea for the above and for headaches. LANDSCAPE USES: Perennial garden, border plants, specimen plants. OTHER USES: Fragrance plant - used to scent linens. Beautiful perennial for landscape. Perfume and moth preventive. 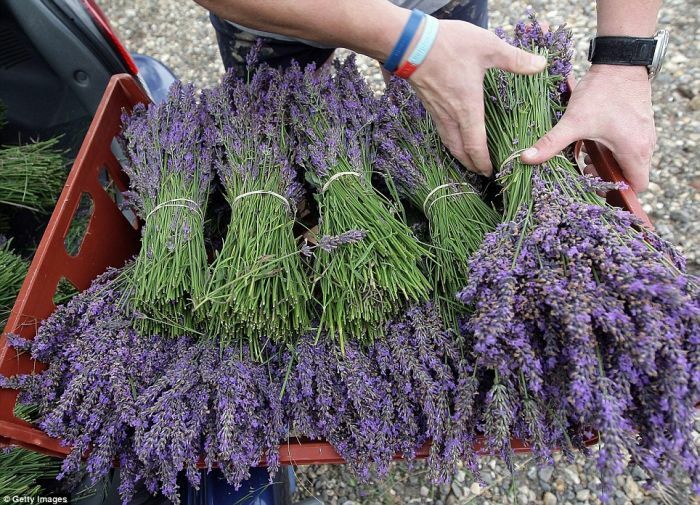 INSIGHT: Lavender angustifolia is English lavender and has smooth edged leaves. French lavender, Lavender dentata, has a serrated leaf. Spanish lavender - Lavender stoechas, is gray-leaved and flat purple blooms with broad, flat-topped clusters of flowers instead of a spike. The pink and white flowering varieties are not recommended.